Columbus Dumpster Rentals Available Right Here! Renting your dumpster from Columbus Dumpster Rental is one of the simplest things you can do. We field a dedicated staff of customer service representatives who work with our customers every day of the week. All you have to do is call our service line and let us know what kind of project you are working on; whether its removing some extra junk from your home or disposing of old shingles from your roofing project. We will be able to determine the volume of debris you need to throw out and recommend the dumpster that best fits the job. One of the great things about using our disposal service is the money you save by renting a dumpster. We consistently offer the lowest rates for dumpster rentals in the Columbus area. And you won’t have to resort to guesswork to figure out what your total bill will be. 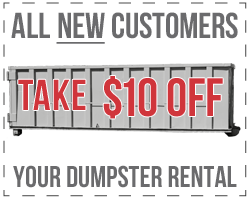 We charge flat rates for all of our dumpster rentals that include the costs of hauling and disposal. So no matter how much debris you need to throw out you’ll always know exactly how much you’re paying for your dumpster. How Can a Dumpster Rental Help Me? A lot of people assume that only construction companies or general contractors have a need for dumpster rentals. But there are an equal number of uses for our roll-off containers around the home and other properties. You can use any of our dumpsters for cleaning out those cluttered corners of your home such as the basement, attic, or even the garage. We accept common residential trash as well as all the incidental odds and ends you might find while cleaning out your home. We also provide dumpsters for various home improvement projects. Our customers rent containers all the time for home remodels, roofing work, renovations, and even to do a little yard cleanup. All of these projects are made a lot easier by having a large dumpster parked right there on your property. Plus, once you are ready to have the bin hauled away all you have to do is let us know. Our customers can request a pickup at any time during the rental period. So there’s no need to wait for your rental to expire before you can say goodbye to your trash!